If you're one of over 30% of Americans who wince in pain when eating and drinking certain foods and beverages, you may have tooth sensitivity. Although there are a number of possible causes, the most common place to look first is tooth dentin. Lying just under the enamel, dentin consists of tiny tubules that transmit sensations like pressure or temperature variation to the nerves of the inner pulp. The enamel, the gums and a covering on the roots called cementum help dampen these sensations. But over-aggressive brushing or periodontal (gum) disease can cause the gums to shrink back (recede) and expose the dentin below the gum line; it can also cause cementum to erode from the roots. This exposure amplifies sensations to the nerves. Now when you eat or drink something hot or cold or simply bite down, the nerves inside the dentin receive the full brunt of the sensation and signal pain. Enamel erosion can also expose dentin, caused by mouth acid in contact with the enamel for prolonged periods. Acid softens the minerals in enamel, which then dissolve (resorb) into the body. Acid is a byproduct of bacteria which live in dental plaque, a thin film of food particles that builds up on teeth due to poor oral hygiene. Mouth acid may also increase from gastric reflux or consuming acidic foods or beverages. Once we pinpoint the cause of your tooth sensitivity we can begin proper treatment, first and foremost for any disease that's a factor. If you have gum disease, we focus on removing bacterial plaque (the cause for the infection) from all tooth and gum surfaces. This helps stop gum recession, but advanced cases may require grafting surgery to cover the root surfaces. You may also benefit from other measures to reduce sensitivity:Â applying less pressure when you brush; using hygiene products like toothpastes that block sensations to the dentin tubules or slow nerve action; and receiving additional fluoride to strengthen enamel. 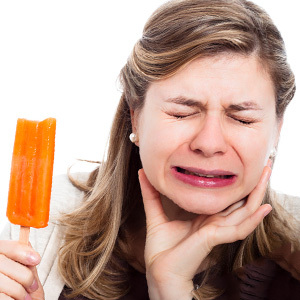 There are effective ways to reduce your tooth sensitivity. Determining which to use in your case will depend on the cause.